Karachi:- LG Electronics revolutionized the vacuum cleaner industry 16 years ago with the commercialization of one of the world’s first robotic vacuum cleaners. LG engineers took advantage of the head start and years of home appliance robotics experience to develop this year’s HOM-BOT Turbo+, which was just recognized by Seoul National University (SNU) Robotics & Intelligent Systems Lab, the robotics program in the nation’s top university, as the most human-like robotic vacuum cleaner in the industry. Artificial intelligence, or AI, which is at the core of all of today’s advanced robots, has many definitions, one of them being the ability to learn from experience. Robots, contrary to science fiction and Hollywood, do not need to be intelligent but they must be machines capable of performing some type of work. Most of today’s best robotic vacuum cleaners have the ability to learn. However, not all robot vacuums learn at the same cognitive level, according to the SNU Robotics Lab results. The university tested robot vacuum cleaners from leading manufacturers to measure their intelligence in the three areas of perception, judgment and action and classified the results into one of three levels of intelligence. The HOM-BOT Turbo+ earned the highest marks, a level the testers labeled Child (the others being Ape and Dolphin) because the SNU Robotics Lab equated the learning ability of the HOM-BOT Turbo+ to that of a six- or seven-year-old adolescent. By utilizing the convolutional neural network (CNN) technique LG engineers are able to give the robot the ability to distinguish between a human and a dog by analyzing stored image data. 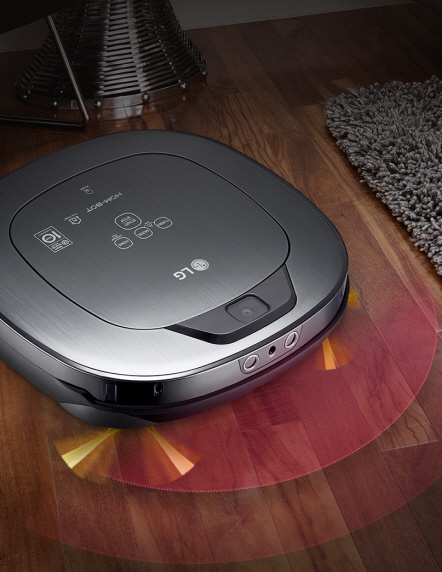 The LG robot vacuum’s acuity of perception and judgment - two of the core facets of a high performing AI - improved significantly with the incorporation of LG DeepThinQ™ technology in the latest model, rising from Ape level two years prior. What separates LG HOM-BOT Turbo+ with DeepThinQ from competing models is its ability to not only recognize obstacles and chart the most efficient course around the home, but its ability to allow for human intervention. For example, when the vacuum comes across a human, it waits for a brief moment to allow the individual time to move out of the way. However, for furniture and other immobile obstructions, the LG robot vacuum knows not to wait and simply goes around and continues cleaning. It’s this kind of analysis which SNU Robotics Lab found to be unique and noteworthy in the category.